Although I must admit the calories burned count happened only during the first round of P90X I recommend everyone to do this at least, same as me, only during the first P90X round. What I have found out during this calculation is that as I progress in my workouts I burn more and more calories. That’s because my fitness gets better and I am able to do the workouts with higher intensity and even endure longer. So, my P90X calories burned differed during the course of the program. 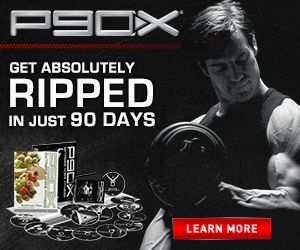 How can you calculate P90X calories burned? Do you think that would be as easy as an calculator and match for everyone? What it’s said about this program is that on average each workout burns 600 calories. So, if you take this for granted you may get relaxed and make your calorie intake more than what you’ve actually burned and you could end up gaining weight, not losing it. That’s why it is important that everyone calculates their own calorie burning. There are some P90X calorie calculators you can find online. Some of them are good and can make a fair estimation of your calories burned. Having this in mind there is one calculator that tells you an estimated calories burned for each of the separate P90X workouts. How it works: Simply select your P90X workout program, enter your weight, the duration of your P90X workout and finally the intensity of your workout to get your estimate of P90X calories burned. It gives a good estimate from what I have compared with my results. This calorie calculator uses average metabolic rates per intensity, for each of the 12 different P90X workout routines. So, you can get your own calculated result for P90X Plyometrics calories burned which will be different to P90X Yoga calories burned. You can find other calorie calculators, but they are all based on averages. However, every body’s different and as I said before the amount of calories burned depends on few factors. So, the most accurate way to calculate your calorie burn is to use a heart rate monitor. These devices also base their formulas on average metabolic rates, but as they are constantly attached to your body they follow your heart rate changes. If you don’t have a heart rate monitor, your fingers can always act like one and you can measure your heart rate on your arm or your neck. Again, this formula gives estimate of the rate at which you are burning calories during aerobic (i.e. cardiorespiratory) exercise, based on your average heart rate while performing the exercise. But, it is more accurate once it is using the heart-rate at the moment of exercising. And if you are sceptical about the P90X calories burned, there is a nice Study by the American Council on Exercise that was put together weeks of testing. “The data provides a lot of evidence to say that P90X does work” are the last words of the study. What are your results? Share them in the comments below!